Mark your calendars everyone! 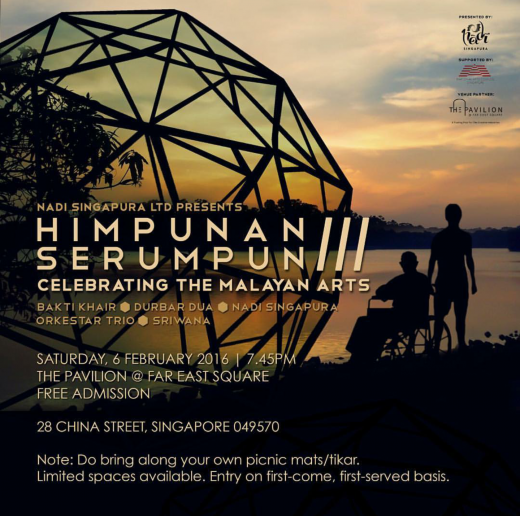 Himpunan Serumpun, presented none other than Nadi Singapura, is back for its third run, with a new line-up of artists coming together to celebrate the Malayan Arts! You are in for an array of amazing performances by Nadi Singapura, Durbar Dua, Orkestar Trio, Bakti Khair and Sriwana! Himpunan Serumpun III will be held at The Pavilion @ Far East Square on Saturday, 6th February 2016 at 7:45pm. An event definitely not to be missed. Come and join us, admission is free!